The last time I did a Monday Post of the 12 + 12 Project or any new Artwork was March 27th. At the time I felt I needed a break. Well, that break lasted 2 days before I picked up the brushes again and even though I haven’t posted any new Artwork over the last five months that doesn’t mean I haven’t been creating Artwork. Next Monday I will start posting the first of eleven 8” x 10” paintings I have completed. Following those Monday Postings, I will return to the Posting of the final 12 paintings of the 12 + 12 Project (of which I have also been working on during my ‘supposed’ break). “A Walk in the Park” is an older work posted as a prelude to the upcoming New Work Postings starting Sept. 18th. Craig! I have missed YOU and your art! I am happy to hear you kept it up even though you took a break from here. It’s hard to post all the time in here. I am glad you are back and look forward to you sharing your art again! Thanks Claudia, these upcoming 11 pieces are small and simple but I liked doing them. Simple can be complicated to a person like me! Always love your work. Claudia, There are, most likely like your writing, that would be more complicated for me to construct. I think that’s life, there are always some things we guild through and some things we have to struggle with to accomplish. These paintings are simple from a design element but I still have to struggle to a certain extent to make color choices as I learn how to do this Oil stuff. I’m still a beginner comparably speaking to other wonderful artists I follow and have seen. I do thank you for enjoying what I create! I missed seeing your artwork every week. 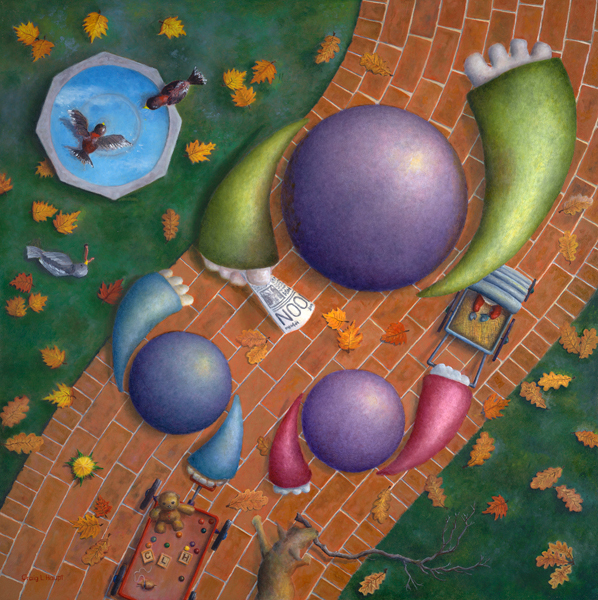 “A walk in the park ” is another wonderful, whimsical painting. The dog with with the big stick is so cute. Welcome back ! I can’t wait to see what’s next . Thanks Sherry, as I mentioned in my comment to Claudia, this grouping of 11 paintings are small and simple but I enjoyed the direction they took me on. Will have to get back up to York to see your work again. Thanks Lee, good to be back! !